I have long professed my love for Twitter. I feel like I can be myself more than I can on Facebook and most of the people I follow are awesome and not sharing long ranting posts full of song lyrics or every detail about their latest illness. Plus, I enjoy trying to be witty in 140 characters. @SuperWendy @LibrarianLizy Honored to be a part of the #tbrchallenge! Thanks much. @SuperWendy @LibrarianLizy May I send either of you the 2nd bk, Season for Surrender? Set entirely during Christmas country house party. I was all over that like whoa. I’ve NEVER had an author offer to send me a book before. I couldn’t believe Ms. Romain’s generosity. Obviously, I tweeted her back and we arranged for her to ship me the book. It arrived on Christmas Eve, autographed, and included a sweet note. Current and future authors: THIS is how you attract loyal readers. She could write crap from now on (which I doubt because she’s really quite good) and I would still read her books. If you’re nice to me, there’s a 99.99% chance I’m going to support you however I can. I finished the book last night and I thought it was really well done. I had a suspicion that I might enjoy it more than the first (which I gave a B), because I like heroines who are more like me – bookish and not quite sure where they fit in. I also like Regencies that are set at house parties. So this was a win for me. My only complaint was that it dragged a little about 3/4 of the way through. But I thought it wrapped up nicely and the ending was more satisfying than Season for Temptation did. 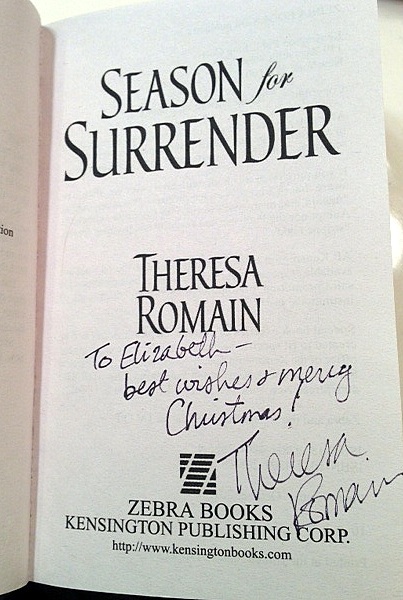 Season for Surrender gets a B+ and I’m looking forward to reading more from Theresa Romain. Next post: “The Best Year Yet” eBook Bundle – 5 Books for $7.40!